Berlin Boyd threatened me from the dais. I wrote a blog in July, 1544 Madison: An Open Letter to Berlin Boyd, which was part of a series of blogs on Boyd. The blog followed Boyd’s interactions with enterprises owned by Bill Orgel, including almost $40K in political contributions, a series of votes on the Land Use Control Board in which Boyd voted for permits for Orgel cell towers and a number of grants to Orgel developments, on which Boyd voted on City Council. I provided some open record requests at the EDGE board and DMC proving eleven meetings between Boyd and EDGE officials, Boyd’s partnership with Bill Orgel’s family firm and other Orgel lieutenants, and the issuance of a $6.2M PILOT to the partnership. Berlin Boyd called me out. At the previous Council meeting on July 10th, Boyd had an interaction with a speaker from the public, Aaron Fowles. In this extract from the official video, at minute 9:56, Boyd talks about Theryn Bond’s ejection from the chamber at the previous meeting and continues “… People who put lies out and people get contracts and go to Nashville and set up TDZ’s. Are you serious. And you sit there and lie and hold your camera…”. I was holding a camera at the time. I had written “Berlin Boyd applied to the State of Tennessee to expand the Tourism Development Zone northwards.”, in relation to the Mud Island TDZ. In the linked article in the Memphis Daily News: “Memphis City Councilman Berlin Boyd said that he’s waiting to hear back from the state of Tennessee about an expansion of Mud Island’s tourism development zone to encompass the Pinch District. Mystery car noted on Facebook. On July 10th, someone posted about seeing a vehicle with Mississippi plates and a “B BOYD” vanity tag parked in front of City Hall. A comment was made that it might be Berlin Boyd’s car and I said it might have been former council member Bill Boyd. On the 24th, I posted on MRYE for people to keep an eye out for this car and get a photo. I did not mention Berlin Boyd, just quoted the vanity plate. Here’s an excerpt from the 2-minute speeches on 7/24/2018, taken from the official video. As I felt that Boyd had directly addressed me on the 10th, I came to Council and spoke. I started out by thanking Councilwoman Fullilove, who had said, “Last fall, I deferred to some of my colleagues on the City Council who expressed concern about IRV. I have rethought my position. The people have already voted for this. We ought to give it a try”. I added: thank you Councilwoman Fullilove, one honest council member”. Then I referred to Boyd’s statement from the previous meeting. 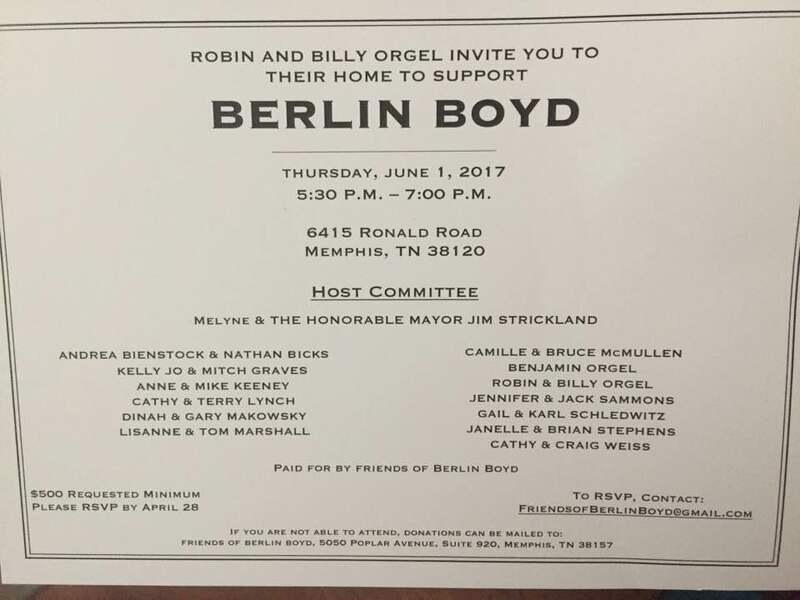 Boyd said that I had said he went to Nashville, then gave the quote above from my blog: “Berlin Boyd applied to the State of Tennessee to expand the Tourism Development Zone northwards.” And then I quoted the original Daily News article which I had linked. I pointed out the misquote. Then I went on to my final point of the evening. 2/28/2017 1544 Madison Partners buys the Madison Avenue property. 9/5/2017: Berlin Boyd votes on City Council for a cell tower special use permit for Tower Assets Newco IX LLC, one of Bill Orgel’s cell tower ventures. This vote happened after the 1544 Madison property deal, so Orgel was a partner of Boyd at the time of this vote. I was about to go on and ask why Boyd had not recused himself, when I got cut off. Berlin Boyd: But I will go on record to put a restraining order against you, because someone’s going to get hurt and it won’t be me. I guarantee that. Have a nice day. Me: So I’m going to get hurt, am I? BB: Sir, you drive by my house and that’s inappropriate. Me: I’ve never driven by your house. BB: I’m not debating you sir. Me: I’ve never been on your street. BB: I have cameras at my house, sir, and your behavior is excessive. You’re stalking me and lying on me every chance you get. Sir, please have a seat. Me: I’ve never lied about you. ** This is a reference to my request for people to photograph the “B BOYD” vanity tag. I never said he was driving the car. I have never stalked Boyd, never been on his street, and I am not on Boyd’s security camera footage. He is a corrupt public figure and I have blogged about him. I have not lied about Berlin Boyd. Boyd issued a physical threat in response to my fair comment. Berlin Boyd lies a lot. He should release his security footage. I predict he won’t. Berlin Boyd is rattled about my blog. There’s a smoking gun there. Please donate to my fundraiser at fundly.com. I’m raising money to pay an attorney to get an order of protection against Berlin Boyd. (Updated 7/26/2018). 1544 Madison: An Open Letter to Berlin Boyd. 1544 Madison Partners (pdf) is a general partnership with Berlin Boyd, Adam Slovis, Benjamin Orgel, Jay Lindy, Michael McLaughlin, Orgel Family LP and Three Madison Partners. Berlin Boyd is the City Councilor for District Seven. Adam Slovis is a realtor and was Berlin Boyd’s employer from 2008 until Boyd’s realtor’s license expired in July 2014. Slovis and Associates acquires cell tower sites for Tower Ventures. Benjamin Orgel is William Orgel’s son. Orgel senior is principal of Tower Ventures, which owns cell towers. He is on the SCS board and is one of the biggest political donors in Shelby County. Jay Lindy is an attorney, and COO and general counsel for Tower Ventures. Micheal McLaughlin is the controller at Tower Ventures. Orgel Family LP is William and Benjamin Orgel’s investment company. Three Madison Partners is the previous owner of the site at 1544 Madison. It is thought to be connected to Boyle Investments, who are mentioned in the 1544 Madison deeds. Berlin Boyd received the following contributions from the above investors between 2014 and 2017: 2/20/2014: Steven (Exec VP for Asset Development at Tower) and Sharon Chandler; Craig (Exec VP for Carrier Leasing at Tower) and Cathy Weiss; Bill and Robin Orgel; Jay Lindy; Craig Royal (VP for Construction and Operations at Tower); and Adam Slovis donate a total of $11,950 to Boyd’s County campaign. All contributions from this section are from the Shelby County Election Commission. 6/1/2017: Benjamin, William and Robin Orgel, Susan Lindy, Adam Slovis and Sharon Chandler donate $6500 to Boyd. 7/13/2017: Cathy Weiss and Craig Royal donate $2000 to Boyd. Total donations in this period from Tower associates: $39,450. There were additional donations in kind for the 6/1/2017 fundraiser at Bill and Robin Orgel’s house. The Tennessee Brewery is an Orgel development. The site, at 495 Tennessee St, was bought by 495 Tennessee LLC which was owned by William Orgel on November 5th 2014. The Commercial Appeal also named Jay Lindy and Adam Slovis as partners. The Commercial Appeal tells the story of the development. The former Goldcrest 51 brewery, built in the 1870s, closed in 1954 and has been vacant since the 1980s. A succession of previous owners ending with The Tennessee Brewery LLC, had spent millions stabilizing the structure but on 11/5/2014 495 Tennessee Partners bought the property for $850K, in a predatory purchase. On 2/10/2015 495 Tennessee Partners bought a parking garage site across Tennessee St. and assembled incentives: parking garage funding, PILOT tax abatement, federal historic preservation tax credits and a city grant to replacing century-old utility infrastructure. Berlin Boyd was helpful with these City boons. Another site north of the Brewery was also acquired for additional apartments. On 5/19/2015 Berlin Boyd voted at City Council for a $5,191,125, City Center Revenue Finance Corporation loan for Tennessee Brewery Parking Garage, in which CCRFC borrows from First Tennessee Bank , builds the parking garage and leases it to the Tennessee Brewery. The loan is to be repaid from the PILOT. Boyd did not recuse himself from this vote. On 5/26/2015, Boyd seconds and votes for a $2.5M capital grant to MLGW after Orgel makes a presentation to the Budget Committee. The grant was for improving utility infrastructure at Tennessee Brewery. Boyd did not recuse himself from this vote. 6/23/2015 Boyd votes at City Council for the budget containing the $2.5M MLGW line item, for Tennessee Brewery. Boyd did not recuse himself from this vote. 12/15/2015: Boyd votes for a $2,250,000 contract at City Council (item 51) for project PW01270, for public infrastructure around the Tennessee Brewery. Boyd did not recuse himself from this vote. 5/12/2016: Downtown Memphis Commission (DMC) approves $28.1M PILOT for Tennessee Brewery. 3/8/2018 LUCB approves street closures for 1544 Madison, minutes (pdf). Boyd was present during that meeting, although not a current member of LUCB. We obtained Open Records DMC emails from Boyd and from DMC to Boyd showing that Boyd and DMC executives were in constant communication, attended meetings together and had casual coffee dates. It is clear that Boyd’s Council status provided him immediate top-level access at DMC. Other Things Boyd did for Bill Orgel. 10/10/2013: LUCB (Land Use Control Board). Boyd votes for 3 Tower-affiliated cell towers (pdf). 11/18/2013: LUCB: (Land Use Control Board). Boyd votes for 3 Tower-affiliated cell towers. (pdf) Boyd voted for many more of these cell towers without recusing himself, literally too many to count. 9/5/2017: Berlin Boyd votes on City Council for a cell tower special use permit for Tower Assets Newco IX LLC, one of Bill Orgel’s cell tower ventures. This vote happened after the 1544 Madison property deal, so Orgel was a partner of Boyd at the time of this vote. Boyd also voted for an Orgel cell tower on 4/1/2015. On 17/1/2016 Bill Orgel bought a vacant property at the northeast corner of Keel and N. Main for $250,000. Deed 1 Deed 2 (pdf), trading as Keel Steet LLC, with the same Viscount Ave corporate address as the other Orgel businesses. This site is a couple of blocks north of the Pinch District, which is undergoing major redevelopment, with Bass Pro and the $9 Billion St Jude expansion. Berlin Boyd applied to the State of Tennessee to expand the Tourism Development Zone northwards. He has been promoting the Pinch redevelopment plan since late 2015. It is still to be seen what will happen at The Snuff Factory, but Boyd and Orgel are on the job. 1/1/2016 Berlin Boyd became the City Council representative on the EDGE board for calendar 2016. EDGE minutes. 2/2/2016 Boyd has a dispute with EDGE board chairman Reid Dulberger over minority contracts by PILOT recipients. Dulberger responded with a report at the February 17th Edge meeting with some numbers on minority and women contracts by PILOT recipients. The Boyd / Dulburger dispute seemed to recede after this, although some commentators say that the dispute provided Boyd with some leverage over Dulberger and the EDGE board. During Boyd’s year as City Council rep on EDGE, he was not marked present at a single EDGE board meeting, although the access that was granted him as a board member placed him in an excellent position to lobby the EDGE Board and employees. 2/28/2017 1544 Madison Partners buys the Madison Avenue property. 5/17/2017 EDGE expands residential PILOTs territory to include Midtown. EDGE minutes. 10/02/2017 PILOT applied for 1544 Madison. 2/12/2018: Smart City writes on EDGE’s “loosest slots in town”, questioning the need for more residential PILOTs. Downtown and Midtown are in the midst of a residential property boom, occasioned by the City’s decision to discontinue new sewer connections in the County. Residential PILOTs are far outside the norm for local government, and, as the announcement of the cessation of new sewer hookups dates only from August 2017, adding a redundant stimulus without first assessing the effect of the sewer impetus is irresponsible. The only proven benefit of residential PILOTs are a tax handout to the property owners. Berlin Boyd’s access at EDGE. Boyd’s dealings at EDGE has given him a lot of access to their highest policy-making levels. We received Berlin Boyd’s email log (pdf) from EDGE via Open Records Request. He received 76 emails between September 2016 and March 2018, mostly invitations to Board meetings, EDGE Performance Review meetings and ED Finance Committee meetings. While Boyd was not marked present at any EDGE meetings we can find, a second Open Records request produced these eleven emails between 2015 and 2017 with additional meeting appointments. Boyd met, at City Hall, First Tennessee Bank, University of Memphis and EDGE, with EDGE management, including Reid Dulberger and Carmen Franklin. It is clear that Berlin Boyd had almost unrestricted access to EDGE board members from January 2106 to present, during the critical time when EDGE was considering residential PILOTs and specifically the pilot granted for 1544 Madison Partners in October 2017. Boyd was a super-lobbyist for 1544 Madison Partners. Berlin Boyd’s relationship with Slovis, Orgel and their associates and ventures dates from at least 2008. Boyd received over $39K and other political donations from them. He voted on Council four times for over $10M of benefits to Tennessee brewery, and at LUCB and Council for at least eight Orgel cell tower permits. He has met with DMC executives many times in the course of his official business. He was an EDGE board member and met numerous times with EDGE executives during a time when EDGE changed policy to allow residential PILOTs and when EDGE granted a $6.1M PILOT to a venture of which he is a partner. He voted for an Orgel cell tower in September 2017 when Boyd and Orgel were partners, without recusing himself. A question for Berlin Boyd. Berlin Boyd. You have been in a position to influence the granting of valuable benefits to your partners in 1544 Madison. Can you show us a cashed check for the amount of your investment in 1544 Madison? Edge valued the investment at $24,775,069. Did you pay the $4.12M that your one sixth share is worth? If that was a freebie, please explain exactly what you did for 1544 Madison Partners and its individual partners to deserve such a valuable boon? CORRECTION: 7/5/2018. We removed a photo of Reid Hedgepeth and an incorrect reference to his company. We inserted an additional item related to a $2,250,000 contract for infrastructure work at Tennessee brewery for which Boyd voted on 12/15/2015. Apologies to all concerned.